Institute Adjunct Associate Professor Bruce Pennay gave a talk on the stories of the migrants that came through the camp as part of the activities for the Bonegilla Migrant Camp reunion, November 2-3. Mapping change over time - Sun 14 October, 10am-3pm, CSU Albury-Wodonga campus. Institute Adjunct Richard Loyn led a "Birds and gardens" event for the Stanley Landcare group on October 16. He also gave a presentation on despotic birds and their effects on the ecosystem structure in flood-prone Black Box woodlands, to the Swamps, Rivers & Ranges local NRM group in Wangarratta, Oct 16, and has accpeted a position on that group's committee. As part of fundraising for the 2019 Bathurst Writers’ and Readers’ Festival, Associate Professor Alison Gerard, Director of CSU’s Centre for Law & Justice, was in-conversation with Australian author and broadcaster Clementine Ford at a fund-raing evening at the Bathurst Memorial Centre, October 2. Ms Ford spoke about her new book Books Will Be Boys. Frogs ‘n Fish Workshop, August 16-17. Seventy seven students from Corowa, Corowa South, Lowesdale and Howlong public schools attended a workshop at the Rivergum Holiday Park, Corowa.The students were participating in a Corowa District Landcare’s Junior Landcare program and, as part of this, learnt more about Sloane’s Froglet, frog habitat, and the importance of frogs from Alex. Frog ID and Arboreal Mammals, Sept 27. Twenty-eight people attended a dusk walk and talk hosted by the Beechworth Urban Landcare and Sustainability Group at Lake Sambell with Alex identifying local frog species by call and spotlighting arboreal mammals. It was a bit chilly, and muddy underfoot, but that didn’t deter a willing band of around 10 helpers participating in the School Leaver Employment Supports package (administered by Job Centre Australia with funding from the NDIS Finding & Keeping a Job program) taking part in revegetation efforts at CSU’s Albury-Wodonga campus on August 7.The recent school leavers and support staff planted native grasses to provide cover for a small population of the vulnerable Sloane’s froglet establishing itself near the David Mitchell Wetlands on campus. Ecologist Dr Geoff Heard was on hand to answer questions from local media and the helpers about the froglet… and plant a native grass or two. The event was organised by CSU Green. Public Relations Stakeholder Analysis Masterclass, Sept 6, Bathurst. Presented by Sharon Schoenmaker, from the School of Communication and Creative Industries. Institute Adjunct Professor Bruce Pennay, a committee member of the Albury & District Historical Society, is one of the people behind moves to extend Albury newspapers coverage on Trove. The Society has been successful in getting a grant towards extending the digitalising of papers back to 1881 and forward to 1942. As part of a City of Melbourne’s Urban Forest and Ecology Team promotion encouraging people in the city to appreciate nature in the city, Professor David Watson spoke on mistletoe at a public event held at the Donkey Wheel House in Bourke Street, Melbourne, on July 16. Professor Watson has led a project in Melbourne which is trialling plantings of mistletoe in plane trees in inner city Melbourne. On June 1 Dr Lee Baumgartner and Jarrod McPherson visited farmer Paul Trevethan’s property “Tara” at Howlong. Paul has diversified into fish farming and the researchers visited the property to learn more about “best practice plumbing in sheds” as part of the background research for the new shed that is being built as part of their Snowy 2.0 project. Professor David Watson was a special guest speaker at a Trust for Nature’s “Mistletoe-friend or foe” field day, Grayton, May 19. The day was supported by the Goulburn Broken Catchment Management Authority with funding from the Australian Government’s National Landcare program. Community meetings were held at the Jindera Community Hub and the Federation Council Chambers at Corowa on May 15 where the results of a joint study (Community driven economic change in small rural community local economic zones. Morrison, M. (2017-2018) Federation Council, $50,000 ) on the economic health of the Murray region were presented. Dr James Van Dyke together with Professor Rick Spencer from Western Sydney University gave a public seminar on turtle conservation at Wonga Wetlands, near Albury on May 11 to an audience of about 30. The pair gave an outline of their research work so far, and proposed actions to save the Murray River turtle population which include a proposal to set up a regional turtle hatchery. About half of Australia’s turtle species are listed as vulnerable, endangered or critically endangered. They also spoke about the effects of fox and road kills on the turtle population. Dr James Van Dyke gave a talk on "Reducing the Impacts of Foxes on Turtles at Winton Wetlands" at a "Sticking our necks out for turtle conservation" community engagement event at Winton Wetlands on April 14. 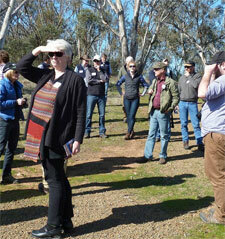 The event was organised by the Friends of Winton Wetlands community group. CenWest Innovate is a collaboration between CSU and the NSW Department of Industry which aims to support the development of entrepreneurship, innovation and small business management capacity in Central West NSW. Roadshows for its six month Next Stage Growth Program were held in February in Oberon, Bathurst, Orange, Parkes, Young, Dubbo with the current program running April 19 to October 5. As part of its Speaker Sessions Dr Denise Jepsen, from Macquarie University and ILWS member Associate Professor Russel Roberts gave presentations on "Increasing employee engagement, wellbeing and effectiveness’, April 4 at Lithgow and Bathurst, and on April 5 at Murrumburrah. Dr Jessie Lymn gave a talk "HALF + HALF" at the ‘Halfway Print Fest (HPF), a celebration of independent publishing, at the Museum of the Riverina in Wagga Wagga, March 3. Dr Alexandra Knight gave a talk at the Whitehead Street Wetland Open Day, Corowa, December 4 as part of the launch of the Corowa District Landcare Group's new $40,000 Sounding the Chorus for Frogs in Corowa’s Wetlands project funded by the NSW Environment Trust. ILWS PhD student Liz Znidersic did a presentation/field day on “The secretive birds at Big Waterhouse Lake” based on her research to the North-East Tasmanian Field Naturalists Club Inc. on December 9. Liz also had a morning at St Helens Primary School talking about birds in early December. An information evening to inform the local community on the results of a research project looking at Macquarie Perch numbers in the Mannus Creek in the Upper Murray was held in the Tooma Hall, December 7.The evening was presented by Luke Pearce, from NSW DPI Fisheries, and Dr Luiz Silva. Dr Jonathon Howard, together with Dr Tim Clune from La Trobe University’s Business School, organised and facilitated a community workshop- Celebrating Our Region’s Contribution to the UN Sustainable Development Goals- in Wodonga on November 29, 2017, to raise awareness of and to celebrate the Border Region’s current contribution to the delivery of the United Nations Sustainable Development Goals. Forty-seven participants representing community groups, not-for-profit entities, education providers, private sector and local government from across the border region, from Albury to Benalla, attended. Dr Lee Baumgartner gave a talk on the carp virus to the Upper Murray Landcare Group in Corryong on October 26. Professor Max Finlayson attended a meeting in Kerang, Victoria, to discuss potential projects on indigenous values of lakes and rivers. The meeting, with local indigenous people on October 4, was facilitated by Mike Nurse from the Federation of Victorian Traditional Owner Corporation. Professor Linda Shields, a nurse researcher, was the guest lecturer at the inaugural Nell Riordan lecture series held at Southern Cross University, Lismore, NSW, Sept 8. In respect to his role as an Independent Scientist with the Lake Cowal Foundation, Professor Max Finlayson attended a Community Environment and Mining Consultative Committee meeting in Forbes, August 30. On July 27, Dr Lee Baumgartner, Dr Nathan Ning and Annette Davies, CSU's Research Partnership Manager, went to Mullumbimby in northern NSW to tour the Mullumbimby community-owned renewable energy project which aims to reinstate the Mullumbimby Hydropower Plan and to discuss fish issues associated with that.The plant is the fourth ever hydropower plant built in Australia and the community is looking at reinstating it so that Mullumbimby can be powered completely off-grid. Institute Adjunct Associate Ian Gray attended a meeting of regional rail user groups in Goulburn on July 19 which discussed how they could work together to further improve passenger train services in NSW.Represented were the Orange Action Croup, the Border Rail Action Croup and the Southern Tablelands Rail Users Group (STRUG). The groups have formed a joint umbrella organisation called Regional Rail Action NSW and highlighted a number of key issues to start lobbying about including more passenger services for regional NSW. A/Prof Gray has also produced a new documentary "Living Rail – In Junee and the Riverina" which was launched at the Junee Roundhouse Museum's 70th birthday celebrations. The short video is on sale at the Museum. In April Dr Lee Baumgartner together with Matt Barwick from Fisheries Research and Development Corporation presented at a community forum in Albury on the proposed carp virus release. The event was organised by the South West Anglers Association and attended by 120 people from as far abroad as Temora and Tocumwal. 'Starting a Business' boot camp March 24 & 25, at Bathurst. The boot camp was led by Troy Haines, CEO of the SPACE, and focused on the theme of 'Turning Ideas into Reality' to invigorate and inspire a start-up business community in the NSW Central West. Institute Adjunct Dr Mary Rosengren is undertaking an Artist In Residence project with Falls Creek Resort Management (FCRM) that is based on Khorloo Batpurev's current MA research project (Botany —Melb University) of peatlands on Bogong High Plains. Dr Julia Howitt was involved in CSU's annual HSC Chemistry program held in February at the Wagga Wagga campus, and was one of the scientists interviewed by chemistry students as part of the program. Institute Adjunct Professor Kathleen Bowmer presented a series of 8 sessions (January to April) for the University of the Third Age in Wagga Wagga. Biocultural Knowledge Workshop, organised with the support of Murray LLS, was held December 6, 2016 at the Wonga Wetlands, Albury. Twenty four people representing CSU and the Institute, Murray LLS, Murray Lower Darling Rivers Indigenous Nations, Federation of Victorian Tradtional Owner Corporations, Murray Darling Wetland Working Group, Albury City Council, Murray Darling Basin Authority, Macquarie University, University of Western Sydney, and NSW Office of Environment & Heritage attended the workshop. Fall of the Derwent is an ongoing public artwork by the Institute's Associate Professor Margaret Woodward and Justy Phillips (UTas) presented by GASP (Glenorchy Art & Sculpture Park) Tasmania, as part of Swimmable: Reading the River. It was launched at a public event on 26 November 2016. The project is supported by Arts Tasmania, Ian Potter Foundation, Australia Council and Glenorchy City Council and Telstra. to call home for immigrants" in Port Macquarie on Monday, Nov 21. On Friday, November 4, 2016 the Woolshed Thurgoona Landcare Group held a spotlighting night at the Hume Dam Wall Reserve picnic area with Drs Wayne Robinson and Alison Matthews. On October 6, 2016 members of the research team for the project Improving groundwater management to enhance farming livelihoods in Pakistan team met with Her Excellency, High Commissioner of Pakistan, Naela Chohan. Dr Dale Nimmo, on behalf of the Greater Eastern Ranges Slopes 2 Summit Initiative gave a presentation on the importance of riparian vegetation for the conservation of woodland birds at the Murray Local Land Services office in Albury on August 15. The Wirraminna Environmental Education Centre, at Burrumbuttock, held an Open Day on Sept 11. Taking part in the day were researchers Professor David Watson, Dr Maggie Watson and Dr Melanie Massarro, all of whom are on the centre's management committee. Maggie helped run some of the activities "for children of all ages" and Melanie gave a talk on her work in Antarctica. As part of an Upper Murray Streams and Rivers Fish Information Session attended by 27 people, freshwater fish ecologist Dr Lee Baumgartner gave a presentation on "Why on earth do we want to release a virus to eradicate carp? Other speakers were from the North East Catchment Management Authority and Fisheries Victoria.The event, held at the Towong Shire Council offices in Corryong, October 19, was organised by the Upper Murray Landcare Network. Associate Professor Rosemary Black made a visit, in October, to Lord Howe Island to promote the work of ILWS and explore potential research collaborations.There she met with eleven people who are based on the Island including staff members of the Lord Howe Island Board and Marine Parks, members of the tourism industry and commercial operators. For this project, funded by a CSU's Rural and Regional Community Initiated Research Grant, Touched By Olivia (the not-for-profit organisation which partnered with Port Macquarie-Hastings Council to establish Livvi's Place in 2014) commissioned Dr Janice Ollerton and Associate Professor Rosemary Black to explore the local community's views on Livvi's Place using face-to-face and on-line surveys.The research, conducted in April 2016, found that Livvi's Place was a well used playspace where people expressed a sense of belonging in terms of feeling safe and welcome. Dr Peter Spooner was one of the contributors to Corowa District Landcare's book Beauty, Rich and Rare, Celebrating our Region's Iconic Eucalypts launched in June, 2016.The book includes a section on survey blaze trees - the subject of a project Dr Spooner and his Honours student Jake Shoard did two years ago using a citizen-science approach involving members of Corowa Landcare and local landholders. Some other large Eucalypt trees identified in a previous project led by Dr Spooner (through the Slopes to Summit's Big Tree Competition) were also included in the book. Dr Manu Saunders visited Grade 5s at Trinity College, Albury on June 3 as part of the School Environment Day activities to talk about wild pollinators. The visit was one of the conditions of her 2015 Outstanding Outreach Award from the Office of Environment & Heritage/Ecological Society of Australia. Dr Saunders, and the other award winners based in Sydney, Melbourne & Canberra, ran an ecological experiment with a local school class to collect pollinator insects on the school grounds. Dr Manu Saunders is the new curator of Australia's Best Nature & Ecology Blogs@ Best.Ecology.Blogs previously managed by ILWS Adjunct researcher Associate Professor Ian Lunt. Institute Adjunct Research Fellow Dr Joanne Millar is a member of the Friends of Yackandandah Creek Committee which is working on a Wetland Rehabilitation Project. She has facilitated Dr Alex Knight to do a frog survey of the area before and after revegetation (funded by a Federal Government Threatened Species Grant for the wetland project). Dr Knight has did community education about frog habitat, species etc. in August. Institute Adjunct Research Fellow Dr Joanne Millar is a member of the Totally Renewable Yackandandah (TRY) Committee. The committee is working on community education and facilitating high energy commercial or community users to use solar energy. In 2015 Dr Millar facilitated a CSU grant to survey local households on energy use and attitudes to renewable energy in 2015. Adjunct Associate Professor Bruce Pennay has produced a picture book Picturing and Re-picturing Bonegilla drawing on Bonegilla Collection at Albury Library Museum and Bonegilla Migrant Place managed by Wodonga City Council and involving post-war immigrants and their children. The project has received funding from the Department of Environment ($8000). The book was launched at the Albury Library Museum, Sept 7. Dr Dale Nimmo delivered the John Paul Memorial Lecture at the Innovations in Landscape Conservation Forum at CSU/GOTAFE Wangaratta, May 17, 2016. The Institute was a partner in this inugural forum organised by North East Catchment Management Authority as a way of bringing around 90 land managers, NRM managers and researchers together. ILWS presenters included Dr Dale Nimmo and Dr Lee Baumgartner. Dr Wayne Robinson was on Fraser Island, Queensland, (11-14 April) to run a workshop for Fraser Coast volunteers and residents from Happy Valley community on the island for the Happy Valley Bush Regeneration Project. Over 200 observations were submitted for the autumn count as the interest in native pollinators continues to grow. With the help of Murray LLS and Kylie Durrant of Holbrook Landcare some handy pocket guides "Pollinator Insects of the South West Slopes of NSW and North East Victoria" have been printed and are available via Dr Manu Saunders. The next count will be run from 13-20 November 2016. Drs Helen Masterman-Smith and John Rafferty presented "Creating Sustainable Communities" based on findings from their Our Place Project Riverina-Murray and the Learning Communities HEPPP project to the Albury Rotary Club a the North Albury Sports Club on March 22, 2016. Prof Kevin Parton gave a seminar on November 24 to the Environmentally Concerned Citizens of Orange (ECCO) on policy to assist the new industrial revolution. The seminar covered Australia's progress in reducing greenhouse gas emissions, recent political history, a comparison between policy alternatives, and Australia's probable future policy. A/Prof Rosemary Black's book,Adventure Programming and Travel for the 21st Century, A/Prof Rosemary Black, & Prof Kelly. S. Bricker, (Eds.) was presented to the Victorian Minister for Education, James Merlino, by the Residential Outdoor Schools Association (ROPA) on November 5, 2015. In 2015 Totally Renewable Yackandandah (TRY) received grant funds from CSU (facilitated by ILWS member Dr Joanne Millar) to complete a research project investigating community attitudes toward a 100% renewable energy goal in Yackandandah. The report by Leah Ginnivan and Tom Stayer is available on the TRY website http://totallyrenewableyack.org.au/watts-happening/news/ Twenty-six in-depth interviews were undertaken in Yackandandah in April 2015. The aim was to find out more about what different parts of the Yackandandah community thought of TRY's goals, following an online survey in December 2014. Overall, people were overwhelmingly supportive of the TRY's goals. Drs Lee Baumgartner and Wayne Robinson ran a community wildlife trapping night with the Thurgoona Woolshed Landcare group around Corry Wood, Thurgoona, on Friday, November 13, 2015. The night attracted about 30 community members, including lots of children. The national Wild Pollinator Count (involving Dr Manu Saunders) was held November 15-22 and included live events on around the Albury region (in partnership with the Slopes 2 Summit initiative). Its Primary School Program provided Years 5 and 6 students in the North East Victorian and Southern Riverina regions with the opportunity to consider the value of higher education for a sustainable future. The excursion component involved over 500 students and staff attending CSU's Albury-Wodonga campus from August to October, 2015, for activities around the theme of 'creating sustainable communities through higher education.' This was followed by a one day Youth Forum on November 13 involving over 400 participants, and the Flourish Community Festival, November 14 which attracted over 1300 community members. Outputs included a Youth Action Statement for a Sustainable Future presented to the Vice-Chancellor, Dean of Students, Head of Campus and Albury Council. The statement was tabled at an Albury City Council meeting and exhibited at the Albury City Library; and the public premieres of five short films made by student participants in the high school component of the program. The incursion component of the project involved nearly 200 students from Years Five and Six. As a result of the High School Program over 300 high school students from Albury-Wodonga visited three universities and active community groups in Melbourne and Albury, from February to March, 2015, to investigate a range of career options while considering how their choices could make their communities and our world more sustainable. The program ran six-day social geography tours for Year 10 and 11 students. There was also a Learning Communities exhibit as part of the Sustainable Living Week partnership with Albury and Wodonga city councils. Institute Adjunct and Chair of the Institute's Advisory Board Dr John Williams was one of the speakers at a public symposium presented by the Goyder Institute, and the Centre for Water Economics, Environment and Policy, Australian National University on "The Basin by numbers: science, economics, community, environment," on September 30. Associate Professor Rosemary Black gave a presentation to the Albury Probus Club on September 23, 2015, called "A life changing journey in Africa" in which she talked about her research for the African Wildlife Foundation (AWF) on the social and economic impacts of tourist lodges on the local community. The research project was completed during A/Prof Black's SSP leave in the later part of 2014. A comprehensive report has been submitted to the AWF which it will use to assess its conservation enterprise model, used to set up tourist lodges. The model aims to improve the quality of life of communities and promote positive local attitudes towards conservation. A/Prof Rosemary Black organised a meeting of representatives of Guiding organisations Australia, Ecotourism Australia and Savannah Guides, at the Ecotourism Australia office in Brisbane on September 15 to discuss the current challenges and issues facing the Australian tour guiding industry and to then formulate potential research projects that could assist the industry to address some of these challenges. As part of the 2015 United Nation's International Year of Soils, the Celebrate Soils Symposium was held at the Albury-Wodonga campus on September 2. Speakers from ILWS included A/Prof Ben Wilson. Professor Max Finlayson, who chairs the Winton Wetlands Environmental Strategy Advisory Panel, attended the inaugural Winton Wetlands Restoration Research Forum, August 20 to 21. The forum saw a number of eminent scientists come together to focus on the ecological restoration of the wetlands. Key project stakeholders were also in attendance to get a better understanding of the ecological challenges the project faces, and to share their views and thoughts. Prof Finlayson spoke about managing and restoring wetlands of international importance; introduced a workshop session on future scenarios- ecosystem restoration goals; and summed up the ideas from speakers and the workshops at the end. Dr Skye Wassens and PhD student Amelia Walcott took a group of more than 30 people interested in frogs on a "Frog Wander" on Saturday, August 15, on a property at Wooragee in North East Victoria. The event was organised by the Wooragee Landcare Group and participants learnt about local frog species, habitat and identifying in the field. Dr Wayne Robinson spent a number of days in August, 2015, with the Barkindji Maraura Elders Environment Team, who are undertaking environmental research in the lower Darling Region, NSW, as part of a collaborative three year project funded by the Indigenous Advancement Strategy and La Trobe University. Dr Robinson assisted with the project's design. Dr Paul Humphries was one of the organisers of the 39th Annual Larval Fish Conference held at the University of Vienna, July 12-17. After the conference, Dr Humphries can a Masters Field Course and a 'Master Class' with colleague Dr Hubert Keckeis, from the University of Vienna, and advised Masters and PhD students. On Monday evening, May 18 Samantha Strong whose PhD topic is 'Exploring paradoxes of native vegetation management in south east Australia in the early 21st century in the context of bushfire' gave a presentation to the Gooram Landcare group. The talk centred on the paradox of "controlling the uncontrollable" in relation to native vegetation management in the context of bushfire. This paradox has emerged as one of the most prevalent paradoxes in the data analysis for the research so far. There was some very positive and interested feedback and discussion following the presentation. The Gooram community had been affected by large bushfires over the past summer, so the issues were fresh in people's minds. A group of Faculty of Business researchers (many of whom are members of the Institute) presented a fascinating "round up" of research over the last decade into a number of climate issues at an "Energy Efficiency and Climate Change Research" seminar on Tuesday afternoon, May 5. The public seminar, co-sponsored by the Faculty and the Bathurst Community Climate Action Network (BCCAN), was held in Bathurst with video links to Albury, Wagga Wagga and Orange and attended by about 30 people including community representatives and CSU staff. Myrmecologyst Dr Wayne Robinson was on Fraser Island, Queensland, in April to run a two day workshop (April 28/29) to a community group at Happy Valley on the island. The group, volunteers and interested community members, were taking part in a Fraser Coast Regional Council (FCRC), Community Engagement Program. FCRC manage three plots of land on Fraser Island and all are fully encircled by the Greater Sandy Region World Heritage Area. Happy Valley is a small one mile square plot with about 50 dwellings including private and business landholders in permanent or seasonal residence. The workshop looked at the role of ants in ecosystems, the importance of biodiversity, the biogeographical affinities of the ants of Fraser island and how the invasive ant species, Pheidole megacephala interacts with native ants on Fraser Island. Associate Professor Robyn Watts (CSU), Josh Campbell and Anthony Conallin (Murray Local Land Services) attended an information booth at the Deniliquin Fishing Classic in February 2015. CSU microscopes were set up at the event giving people the opportunity to have a close up look at small larval fish and aquatic bugs. The staff also distributed a wide range of information sheets and brochures and chatted to people about the river monitoring underway in as part of the Commonwealth funded project monitoring ecosystem responses to environmental watering in the Edward-Wakool system. The Institute's Dr Wayne Robinson is a member of an on-going community research project called the "Bitterns in Rice Project". It is a collaboration that started in 2012 between the Ricegrowers' Association of Australia, Birdlife Australia and other organisations. It is being led by former CSU honours student Matt Herring. The project has received funding from Riverina Local Land Services and the team recently completed the surveys for a third rice-growing season, with 80 sites covering 2050 hectares of rice on 41 randomly selected farms. The Institute, along with the NSW Government's Environmental Trust and the Great Eastern Ranges Initiative, sponsored the Slopes to Summit (S2S) Big Tree Competition which ran from February this year to the start of April. The competition generated plenty of community interest with entries even coming beyond the S2S project area, which covers an area north of the Murray River from Mount Kosciuszko to Corowa, and south of Henty, Holbrook and Tumbarumba. The response to the competition was very strong nation-wide as indicated by the hits on its Flickr page, which had over 14,000 views in four days after the winners were announced. The winner of the Big Paddock tree (submitted by Anne Hicks, Holbrook) was a River red gum (Eucalyptus camaldulensis) with a girth 950cm circumference at 1.3m above ground. "S2S is about increasing connectivity across the landscape for biodiversity which is strongly linked to the aims of the Institute's Biodiversity Conservation SRA," says Dr Peter Spooner who is on the S2S Working Group and leader of the Biodiversity Conservation SRA. 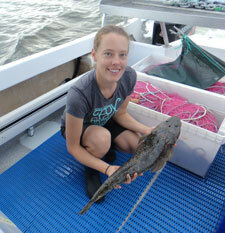 As part of the project investigating the Fecundity and egg quality of Dusky flathead in East Gippsland honours student Tara Hicks worked with the residents of Mallacoota to help with her survey to understand the link between fish size and egg quality. The local fishers donated their fish frames (what is left after the fillets are removed) which contributed to the approximate 500 fish Tara used in her analysis. She will give a presentation on her findings to the Mallacoota community and the Australian Society for Fish Biology later this year. The major output of the project " Community connections, older and vulnerable community members – identifying, exploring and addressing community needs within the Blue Mountains", is the report, Community Connections: Vulnerability and Resilience in the Blue Mountains (PDF) which was launched this year on March 25, at Springwood Sports Club. The event, attended by nearly 100 people, included community members and representatives from both emergency services, Ministry of Police and Emergency Services and community services. The report was officially launched by Councillor Mick Fell on behalf of the Mayor of the Blue Mountains, Mark Greenhill. The report makes a number of recommendations, which include strategies to better connect community members and organisations in order to inform planning for vulnerable and ageing populations both in day-today life and in times of emergencies. From January 20 2015, Dr John Rafferty has been on air every fortnight on ABC Goulburn Murray Morning Radio on Tuesdays from 9.30am discussing the latest science news, particularly related to sustainability and its environmental and social impacts. 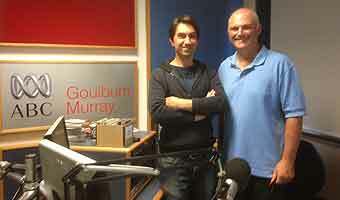 Pic Dr John Rafferty (right) with ABC Goulburn Murray's mornings presenter Joesph Thomsen. The premise of the show "Science and Stuff" is twofold. Firstly to build levels of science literacy among the broader community; to promote thinking scientifically. Secondly, to build genuine excite about science and highlight the omnipresence of science phenomena in our daily lives. * How are fire ratings established? * What is UV light and how does "sun block" work? * Evaporative cooling how does it work? * What is thunder and lightning? * How does hail form? These topics and questions provide a platform to explore science phenomena in plain English within common experiences. The discussion in the program also extends to current scientific news and events (that is what ever is in the newspapers). Recent examples of community engagement from two of our postgraduate students include the work of Amelia Walcott who is producing regular fact sheets for landholders involved in her frog research project in the Lachlan region and Vijayakumar Kuttappan, who is a board member of the Albury-Wodonga ethnic communities Council inc. Check out the Council's latest Summer newsletter ethnicvoice. First there was the Climate Change and the Community forum held in the morning at the Albury Entertainment Centre which organised by the Murray Darling Association with the support of the Institute, Albury City Council, the Regional Centre of Expertise Murray-Darling and the Australian National University. The event was attended by more than 120 people made up of the local Member for Albury, Hon Greg Aplin; Mayors, Cr Kevin Mack from Albury, and Cr Paul Maytom from Leeton; councillors and staff from Indigo Shire, Rural City of Wangaratta, City of Wodonga, Albury City Council and the Alpine Shire; government department staff; representatives from the Murray Darling Association; CSU students and staff; community members; and staff and senior secondary school students from Albury High and Victory Lutheran College. The launch of the Our Place - Riverina and Murray project and showcase of the projects' achievements so far on Monday, August 18 at the Albury-Wodonga campus was well attended. More than 55 people were present including community members from Holbrook and Albury, a large contingent from the Albury Wodonga Community College and Albury's Bhutanese community, Office of Environment and Heritage and Albury City Council staff, and CSU's Albury Head of Campus Professor Julia Coyle who gave the official welcome. South-West Regional Manager for the NSW office of Environment and Heritage (OEH), Mr Graeme Enders launched the project which aims to assist communities to protect their local natural environment and to live more sustainably. Two Institute members – A/Prof David Watson, and PhD candidate Alexander Knight - were involved in the Holbrook Landcare Network's "Wildlife in our landscape – are we making a difference?" event held on Wednesday, June 18 in Holbrook, with David the MC of the event, and Alex presenting on Frogs on Farms. A/Prof David Watson gave a presentation on mistletoe in grassy box woodlands to an Australian Plants Society meeting in Albury, Saturday, March 29; on bird-mistletoe interactions to the Southern Highlands Group of Birds Australia at Mittagong, Tuesday, April 8, and on parasitic plants as facilitators to the Australian Native Plants Society, Thursday April 10 in Canberra. For the week April 20-26, while out in the field in western NSW, Dave was the "real scientist" for the @realscientists twitter account which has a different scientist taking the reins each week. Eleven to 12,000 people follow this world wide and Dave tweeted on a range of topics including day-to-day experiences out in the field, grant-writing, work-life balance and, of course, mistletoes, bird ecology and arid zone flora and fauna giving followers a "window" into his life. An interesting outcome of Dave's tweeting about his research while out in the field was feedback from Bindi Vanzella, the Business Development Co-ordinator for Greening Australia Capital Region, who sent a copy of a tweet conversation she had with Dave regarding management tips for lone trees with lots of mistletoe to colleagues and landholders. His tips - which are to fence off; plant nectar rich understorey shrubs; and install nesting boxes for birds and brush tailed possums - were passed directly to implementation staff and are already informing on-ground actions in the ACT. Dr Joanne Millar gave a talk to three landcare groups – the Yea Wetland Group, Upper Goulburn Landcare Network, and Strath Creek Landcare Group on Saturday, February 22 about the project on Pak Peung wetland in Laos. A/Prof David Watson was among a group of ecologists from the Institute (others were Dr Alison Matthews, Lisa Smallbone and Alex Knight) who took part in a BioBlitz hosted by a local conservation partnership, Slopes to Summit (S2S) on the weekend September 6 to 9. The weekend saw around 300 people searching for wildlife in National Parks, farms and road reserves around Woomargama in southern NSW as part of a BioBlitz. Lead by expert ecologists, the small army of local school children, farmers, amateur naturalists and other folk helped search for native birds, mammals, reptiles, frogs, fish, and plants. The records will be uploaded on to the Atlas of Living Australia to help add to our existing knowledge of the area's biodiversity. The event coincided with National Threatened Species Day, fitting recognition given that many native species in Woomargama are considered at risk of extinction, including the iconic Squirrel Glider. The free community event was organised by the Slopes to Summit (S2S) partnership of the Great Eastern Ranges Initiative, one of the nation's largest conservation projects stretching 3,600km from the Grampians in Victoria to the Atherton Tablelands in Queensland. To coincide with National Wattle Day on September 1, A/Prof Dave Watson was one of the speakers at a "The Birds and the Bees" day held at the Wirraminna Environmental Education Centre. Dave spoke about native birds in the garden and what you can do to look after them. Professor Allan Curtis presented the keynote speech to about 70 people gathered in Albury on Friday 10 May 2013 for the local Landcare Conference. Dr Alison Matthews and ILWS PhD students Lisa Smallbone and Alex Knight were once again involved in the Rotary Murray Darling School of Freshwater Research Easter School at Wonga Wetlands. Their involvement included setting harp traps, catching 16 bats, and running a spotlighting activity one evening. Institute adjuncts Prof John Mullen and Ms Cathy McGowan (who is also an ILWS Advisory Board member) were appointed to a national task force "Doing well by doing good" in March this year. ILWS PhD student Carmen Amos was one of four presenters at a healthy dams workshop for landholders organised by the Hovells Creek Landcare group in collaboration with the Boroowa Community Landcare group on March 16. Carmen's presentation was on frogs in the Lachlan Catchment, what environment frogs require and how you can promote them in your dam. "It was a wonderful day and it was great to see so much enthusiasm and interest in not only how to keep your dam healthy for livestock but making it a more desirable place for native fauna," says Carmen. The day was also interactive with workshops on how best to construct and manage your farm dam and how to identify local frogs. It was held on Byron Corcoran's property 'Forest Home', Frogmore. Institute Adjunct Associate Professor Bruce Pennay, OAM was invited to speak at the Benalla Australia Day celebrations, on January 26, 2013. He gave a presentation on Migrant Heritage. Professor Max Finlayson attended a meeting of the Scientific and Technical Advisory Group for the Winton Wetlands Restoration Project in Benalla on Dec 14. The Slopes2Summit partnership, part of the Great Eastern Ranges Initiative, hosted the premiere on November 26 of the "Snow Gums to Red Gums" film, produced by Mosquito Productions for a project funded by the Bjarne K Dahl Trust, Caring for our Country and the NSW Environmental Trust. Over 100 people turned out to the CD Blake Theatre at Charles Sturt University to see some local people from Tumbarumba to Howlong talking about their relationship with Eucalypts. After the screening, the partnership also launched the "Bushlinks" project – a farm revegetation program focussing on connectivity for wildlife that is being managed by the Holbrook Landcare Network on behalf of the Slopes2Summit and the Great Eastern Ranges Initiative, in partnership with Murray CMA. The film was hosted by co-writer/producer A/Prof Dave Watson. The Slopes to Summit Partnership is part of the Great Eastern Ranges initiative working together to progress biodiversity conservation in the eastern Murray . A/Prof Dave Watson's presentation on the role of mistletoe and wildlife on farms to about 35 farmers and community members at the Mullengandra family field day on September 21 led to several participants keen to change their gardens and defendable spaces. Find out more in another great PlaceStories story. is predicted to be around 50% in the next decade. Dr Emily Mendham was interviewed by the ABC Riverina Rural report on Sept 3 as a result of her involvement in the North East CMA the expert panel event on 30 July. The ILWS study undertaken last year by Dr Mendham and Social researcher Prof Allan Curtis assessed the impacts of changing land ownership in rural areas. Professor Max Finlayson attended the August 20 Scientific and Technical Advisory Group (STAG) meeting for the development of the the Winton Wetlands Restoration and Monitoring Strategic Plan. More than 30 people took part in the Deniliquin Council and Charles Sturt University public lecture presented by ILWS Professor Dirk Spennemann on August 15. The lecture, titled 'Echoes of the past: Tracing the German experience', explored the German farmers who began to settle in this region in the 1860s, their farming practices and their architectural methods. Water Reform and Climate Change Can we do more with less? A discussion on Water Reform and Climate Change in Australia was held over 18 - 19 August 2012 at the CSIRO Discovery Centre, Canberra with ILWS Professor Allan Curtis speaking in Session 2: Murray-Darling Basin - What to do with the water? Water reform, climate change and farming in the Basin: some different perspectives. On April 17 Professor Max Finlyason and Professor David Mitchell attended the forum in Bairnsdale where Max gave a presentation on Ramsar requirements and wetland management.